Qweri (https://lexum.com/en/products/qweri/) is Lexum’s document viewer. This software specializes in viewing and navigating large documents, such as the Court Reports. Decisia 5.0 makes it possible to configure a bridge between Decisia and Qweri. A Decisia collection dedicated to Qweri will allow you to publish your big documents directly in Qweri from your Decisia administrative interface. These documents published in a collection dedicated to Qweri are available via Decisia; they can be found by browsing or searching on your Decisia website. However, when you click on one of these its documents, it will open directly in Qweri. So, with this bridge, you can take advantage of Decisia’s powerful search engine, user-friendly navigation and robust administrative interface, all while enjoying the many benefits of Qweri, such as the ability to annotate documents and a navigable table of contents. If you would like more information on this bridge, we invite you to contact us. Starting with Decisia 5.0, the new approach to publishing PDF documents announced by Lexum in the fall of 2017 will be rolled out gradually to Decisia customers. You can consult Lexum’s blog https://lexum.com/en/blog/lexums-new-approach-to-pdf-publishing/) and contact us for more information. Decisia 5.0 allows you to make changes to a large group of entries at once. In the administration interface, you will now find above your search results a “Enable bulk update” check box. By checking off this box, you enable the group selection option of your search results. To select one or more entries to modify, simply check off the checkbox to the left of the corresponding entries. 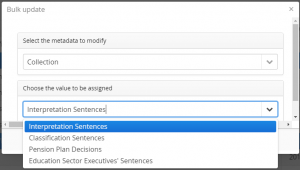 Once you’ve made your selection, you will be able to click on “Modify selected decision (s)”. 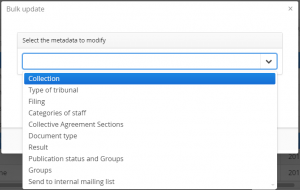 A window will then allow you to choose from a drop-down menu the metadata you want to modify, as well as the value to assign. Then click on “Save”. A confirmation window will ask you to validate the mass update in progress. Finally, click “Yes” to confirm the application of the update to all selected entries. Before Decisia 5.0, to publish a PDF that differs from the one automatically generated by Decisia (for example, a PDF that bears a handwritten signature), it was first necessary to (1) upload the Word document, (2) save the entry, (3) search for the entry in the database, (4) modify the entry to upload the PDF in question and (5) save the entry again. With Decisia 5.0 we have simplified this process. You can now (1) upload a Word document and a PDF document that differs from the one generated by Decisia at the same time and (2) save the entry. In other words, both documents will be uploaded and saved in parallel. In the “Add / Edit Decision” forms accessible via the administration interface, the drop-down menu for the “Publication Status” field has been replaced by three radio buttons. These allow you to quickly choose the status you want to assign to your entries and make it easier to see the “Groups” field that appears when the “Publish” status is assigned to an entry. With version 5.0, the advanced search by “Subjects” (if this field is enabled for your installation, it is displayed last in your advanced search) switches from a single selection search to a multiple selection search. In other words, Decisia now allows you to search by multiple subjects at the same time. 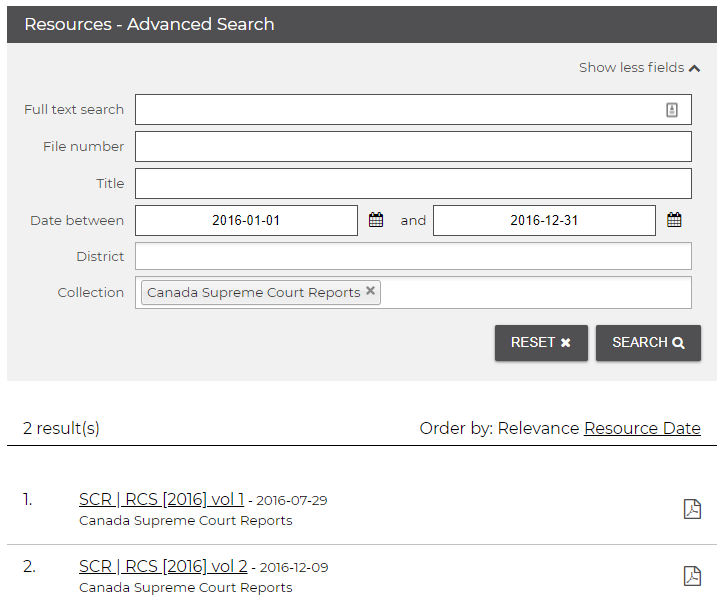 All documents that have been assigned any of these multiple subjects will be returned in your search results.